Those of us who started driving on cross-ply tyres were taught about driving habits, as well as care and maintenance, and wheel rotation to even out and prolong tyre wear. 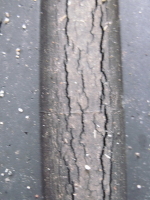 The walls of cross-ply tyres were easily damaged by nudges against kerbs with the blister, or cut, usually meaning the replacement of the tyre. Although everyday 1950s/ 60s cars did not have performance acceleration and braking we had to avoid suspension bounce, and to be careful when cornering fast to prevent rear end axle tramp and the risk of rolling the front tyres off the rim. We had to look for uneven wear due to under inflation or incorrect tracking and toe-in, to check wheel alignment especially after a nudge against a kerb, and remove stones from the tread. Even then tyres seldom lasted 10,000 miles and punctures were fairly common. Since the coming of radials carcass structure and compound technology has continually developed to provide drivers with stronger tyres, improved grip and better wear so that tyre life increased to 18,000 miles, then up to 30,000 and now 40,000 even on modern performance cars, is not unusual. Nowadays we don't seem to bother about wheel rotation, give scant regard to tracking and toe-in and looking for tyre wear, perhaps not until the MoT test and the need for replacement tyres is pointed out, and we may check the pressure once a month or not until it looks a bit flat! I doubt if we have ever considered tyre ageing because tyres never lasted more than a year or two, we sold the car or wrote it off. So when I read the FIVA 'Guide for Users of Historic Vehicles' and the paragraph "Because tyres do not last indefinitely, even in storage, pneumatic tyres should be replaced.... whether they are worn or not, after a number of years in accordance with the manufacture's recommendations or other guidelines." I thought yes, the tyres did deteriorate when my 'Seven' was stored for 20 years, mainly, I thought, because I seldom moved it and did not jack it up. But then the words 'number of years - manufacturers recommendations' triggered the question, how many years and what recommendations? As I am only doing 1200 miles a year in my 'Seven' is there something that I need to know? An internet search soon found masses of information on American websites where tyre ageing is a major topic due to an ongoing Ford vs Firestone saga over a series of accidents. The Federation of British Historic Vehicle Clubs cited a fatal accident involving an MG B at speed on the M56 motorway. 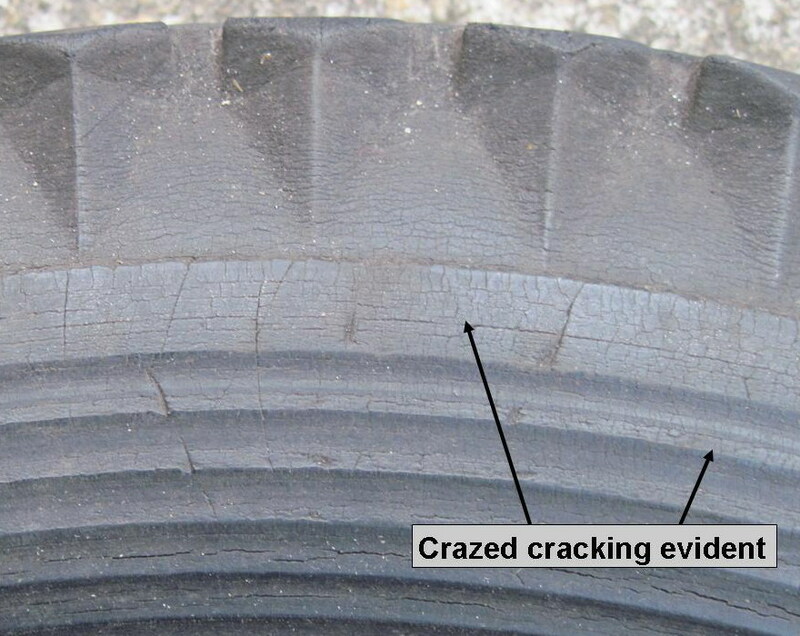 The subsequent Police investigation found indications that the tread had separated from the carcass when the rear tyre burst and that the tyres were 25 years old. Tyre ageing may have been a contributory factor to the incident. The Royal Society for the Prevention of Accidents (RoSPA) offers good advice on their website in a useful section ‘Tyres Information Sheet’ , so I quote in part: "Rubber compounds used in tyres contain anti-oxidising chemicals that help to slow down the natural ageing process of untreated rubber. However, tyres do deteriorate with age, which increases the risk of tyre failure, and there may be many ways in which this can be spotted: cracking or crazing on the side wall, distortion of tyre tread, deformation of the tyre carcass. There will also be deterioration in the ride quality caused by vibrations through the tyre. This may signify the tyre's performance has been affected by age." Several websites make the point that deterioration occurs in storage without the tyre ever being used. Also damage through ageing may not be seen externally, it can be within the carcass and we all know that vibrations in 'Sevens' can be caused by anything, so is there some more specific information? Remeber that tyres have two sides so check the inside wall as well. Now that our pre-1960 cars are not subject to a compulsory MoT (UK) we have a greater responsibilty to check our tyres for ageing. RoSPA's advice continues with "Tyres that have been in storage should not be used if they are over 6 years old, from their date of manufacture. When a tyre has been in use, the effects of ageing are lessened to a degree, but such tyres should be replaced after 10 years, irrespective of the mileage covered.” We are always warned to bring our spare into use and not to leave it unused until a puncture occurs. Modern tyre 6 yrs 9 mths old with 6mm usable tread remaining had cracking in the tread after 37800 miles on rear (non-driven) wheels, regularly checked for correct tyre pressure. Now the problem might be, what was the date of manufacture from which time the tyre started to age? The chronological age of a tyre is found in the DOT Code, issued by the US Government Department of Transportation, normally visible on the outside tyre wall. It is an alpha-numeric sequence of 11 or 12 digits in the form DOT XXXX XXXX 000 providing details of the manufacturer and the factory with the third set of digits being figures indicating the week/year of manufacture, so 178 indicated the 17th week 1988. At the beginning of the 1990s the last 3 figures were followed by a ◄, so that 328◄ indicates that the tyre was made during the 32nd week of 1998. Since 2000 the last set of digits has been 4 figures, ie 1403, which means that the tyre was made in the 14th week of 2003. There is a warning on a few websites  that if the tyre has a 3-digit date code then do not buy it, or use it, as it is too old. The DOT Code on the outer wall of a new tyre fitted to a modern car. The last 4 digits show that the tyre was manufactured in the 50th week of 2009. The DOT code on the Firestone cross-ply tyres, made in the USA, fitted to my 'Austin Big Seven' is on the inside tyre wall. It omits the letters DOT but there are 12 digits, the last set being 0302. This indicates that the tyres were manufactured in the 3rd week of 2002, and, therefore, when I purchased them in July 2003 they were already over a year old. DOT code on Firestone cross-ply tyre. There is no technical data to show the age, or usage, after which a tyre should no longer be used; it is solely due to regular inspection for signs of cracking in the walls and within the tread. The tyres on the majority of modern cars will be replaced due to normal wear and tear after high mileage and so tyre ageing is unlikely to be a problem. However, tyres on historic cars often cover less than a 1000 miles per year and so tyre ageing should be monitored as it may well appear before there is any evidence of loss of tread depth. Many 'Seven' owners will have tyres that are in storage, or were stored for some time before being put into use, so perhaps it is time to give them a thorough examination and to look closely at the side walls and tread when the tyre is partially, or fully, deflated. But do be extra careful if you buy used tyres from an autojumble, an internet auction site or a well meaning friend. If you have just put your 'Seven' back on the road after many years you should examine the tyres carefully, not just the tread, seek expert advice and replace them if necessary. Even at 45mph an incident, not involving anyone else, may result in costly damage and inconvenience. Also we have a legal obligation to maintain our car in an efficient and roadworthy condition for insurance purposes; that is not just the lighting, bodywork, steering and brakes etc. but all aspects of the tyres as well. This information has been drawn from many websites providing information on tyre ageing and DOT codes. The original article, written by Doug Castle, appeared in CA7C Seven Focus in Feb 2007 pp18-19 and revised for CA7C Seven Focus January 2010 pp 20-22.